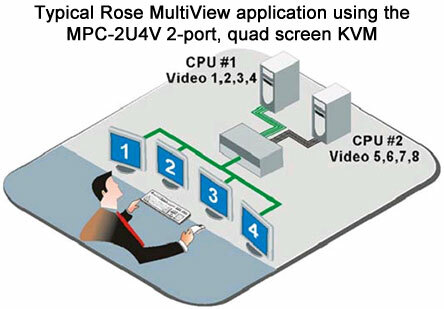 The Rose MultiVideo MEC-8U2V delivers keyboard command switching between different multi-platform CPUs that are sending multiple video signals. With the rose MEC-8U2V a user can easily switch between eight computers to view dual video outputs per CPU. Daisy chain MultiVideo units to support up to multi-platform 64 CPUs. The MEC-8U2V uses simple keyboard commands to switch between computers. The optional on-screen display (call 1-877-586-6654 for availability and pricing) allows switching from the streamlined highly customizable visual interface. The MEC-8U2V's high resolution capabilities make it ideal for many diverse applications including financial trading, emergency call centers, television studios, medical imaging, video editing, process control, and CAD/CAM to name just a few. Combine the MEC-8U2V with Rose's ViewLink or CrystalView extenders and extend the local console up to 10 km (approx. 6 miles) away.